Paperback version now available! See the Manchester University Press website. Cheaper copies may also be available through Amazon and Ebay! The posts on this blog are based on research I’ve been doing on the Irish families who lived in Stafford between 1820 and 1920. I’ve recently published a book, Divergent Paths, on their lives in Stafford. They were in many ways a microcosm of the wider Irish experience in Victorian Britain. 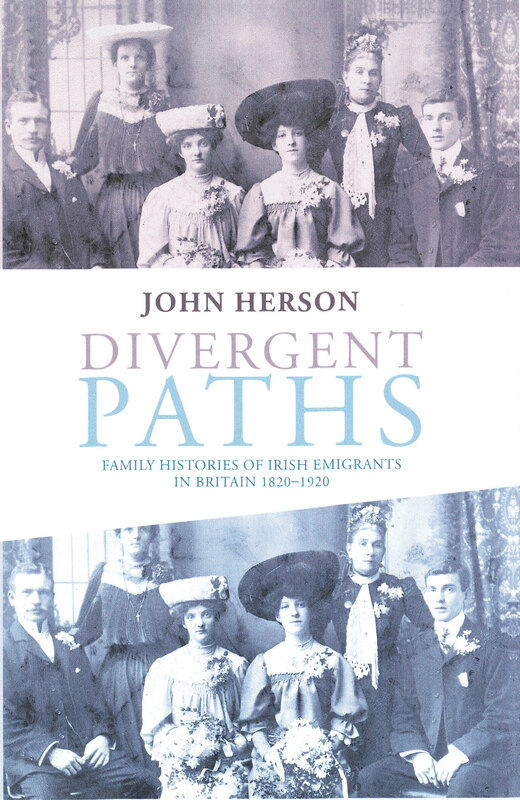 Divergent Paths uses family and digital history to see what happened to all the Irish families who settled for at least ten years in Stafford. It presents unique evidence about the lives of ordinary people and their varied experiences. Their fates were complex and often divergent. Many families integrated into the local population and became Staffordians. Others ultimately moved away. Some simply died out. Divergent Paths explores why the fate of the town’s Irish families proved to be so varied. In doing this it also throws light on Stafford’s broader history in Victorian times. ‘In this remarkable book the author gives … voice to generations of the type of people that do not ordinarily feature in history writing. (It is) unlike anything else in the canon of Irish migrant studies.